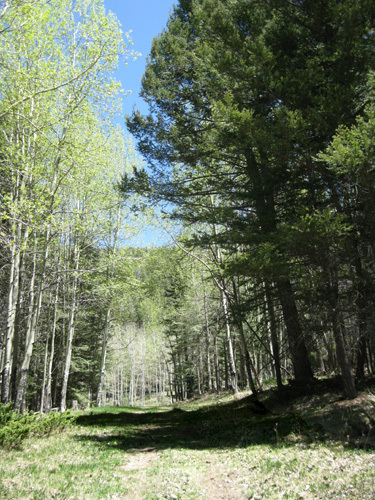 "One of eight official byways in the state, the Jemez Mountain National Scenic Byway has an abundance of scenic, natural, cultural, and historic assets. 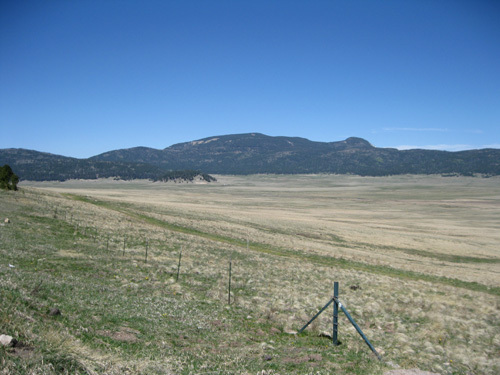 This 132-mile loop accommodates most vehicles and offers a convenient and rewarding way to experience the best of Northern New Mexico -- in just one day!" You might be able to drive this "loop" (which is mostly a long out-and-back) in one day but you definitely need more time than that to get out of your vehicle and do a bit of further exploring. It took us at least three separate trips and we still didn't get to all of the sites along the way. That's OK. It leaves us something to do on our next trip to the area! 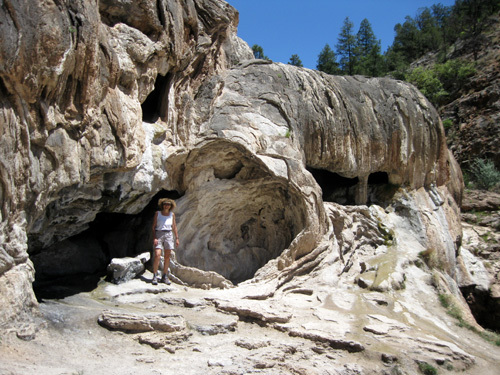 This route covers a lot of ground including the Valles Caldera National Preserve, Jemez Falls, the towns of La Cueva, Jemez Springs, Ca�on, Jemez Pueblo, and White Rock, several warm and hot springs, Battleship Rock, Soda Dam, Jemez State Monument, the Gilman Tunnels (a side trip we didn't take), Bandelier National Monument and its northern unit, the Tsankawi Pueblo Site. 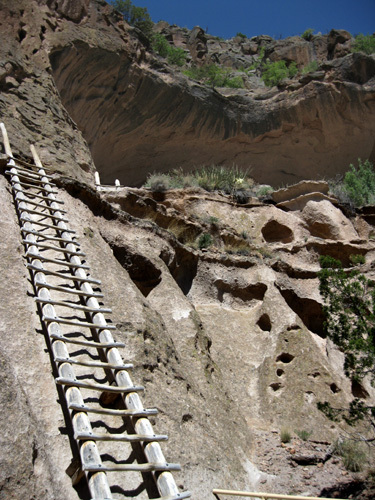 In this entry I'll show some photos from most of the above except Bandelier,Tsankawi, and White Rock. They'll be in the next two entries. At Hwy. 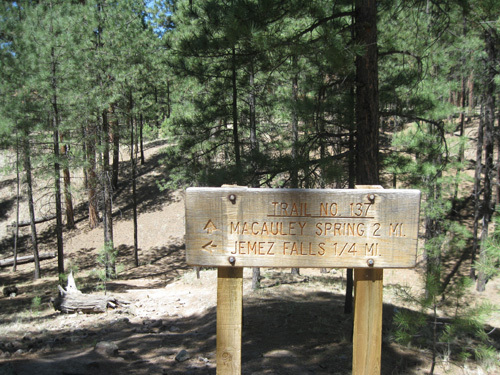 4 we turned right and drove west and south for about twenty-five miles to the town of Jemez Springs. We quickly climbed to about 9,000 feet and had some fine views into the valleys below us. 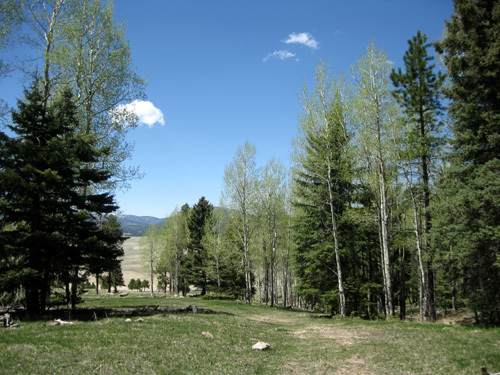 This route passes through thick pines and open meadows on national forest lands, a part of Bandelier National Monument, the Valles Caldera National Preserve, and private property in the town of Jemez Springs. 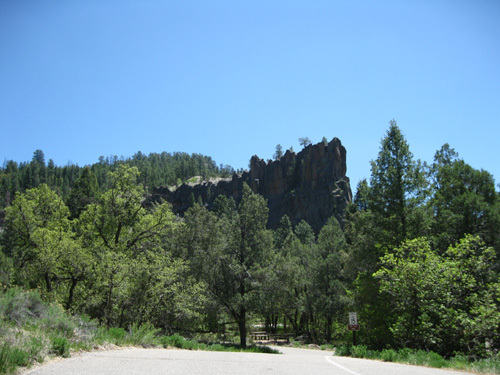 Our first stop was at signage for the Cerro Grande scenic viewpoint but I read the sign too quickly, thinking it was a two-mile drive on forest service roads, not a hike on trails, overlooking the caldera from Bandelier's highest point at 10,199 feet. During our driving tour I wanted to scout out a place to run, but on our way back to town, not right then. We took FSR 289 east into Bandelier, the wrong direction, and had a pleasant little drive but didn't find the overlook. Well, duh, the Cerro Grande is a trail on the other side of Route 4 but I didn't know that until later. That's OK. I can do that run/hike on another trip. I really enjoyed the run that I did several hours later in the Preserve. WOW, THAT WAS SOME ERUPTION! 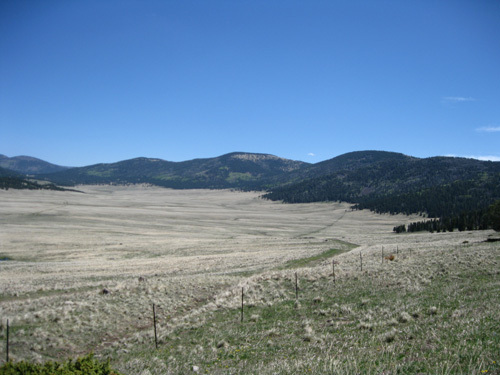 After a few minutes we returned to Route 4 and continued on to the Valles Caldera National Preserve, 89,000 acres of high meadows and mountains. 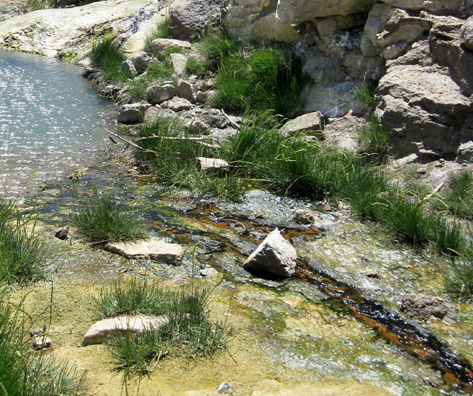 The Preserve was created from private ranch land in 2000 by an act of Congress for the preservation of this unique environment, which includes one of only three active volcanic calderas in North America. Note the designation of "active volcano." Also note that the preserve is home to mountain lions and black bears, among many other species of mammals and at least 55 kinds of birds. 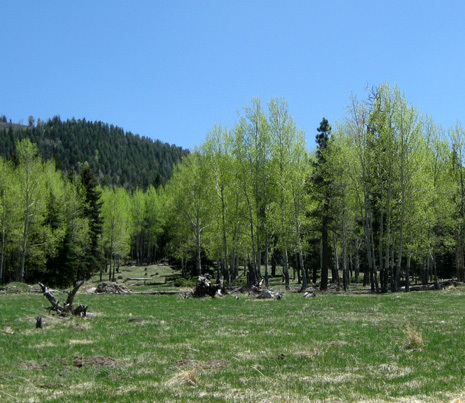 In a few days, Jim and a couple hundred other runners in the Jemez Mountain Trail 50-miler will be running through part of the Preserve shown below. Oh, and I'd be running alone on a nearby trail that afternoon . . .
Not to worry. We often find ourselves running in territory inhabited by creatures that could do us harm if we aren't alert and prepared to defend ourselves but we don't often tread near potentially active volcanoes. I'd be more concerned running anywhere near Mount St. Helens or somewhere in the Hawaiian Islands than in Valles Caldera. 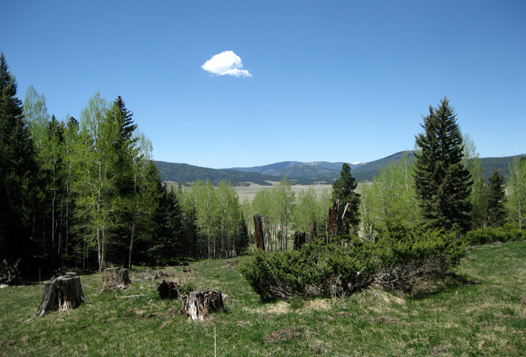 I think the creation of the Preserve and region surrounding Los Alamos is fascinating. 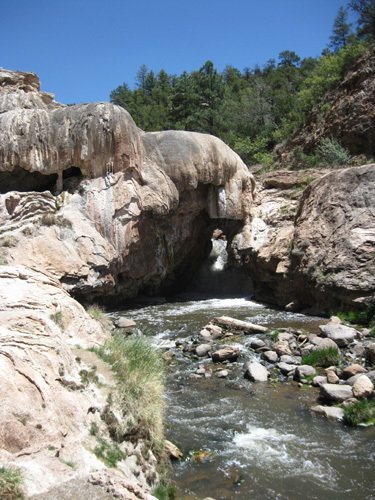 The Jemez Range began to form about 13 million years ago. 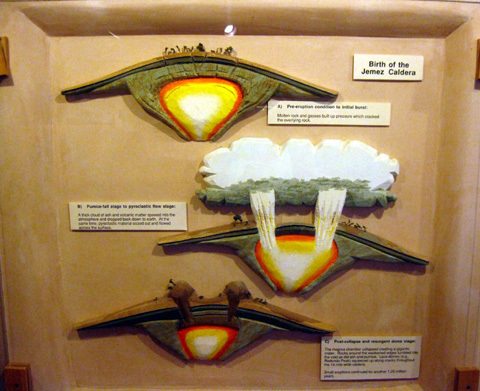 At least two cataclysmic volcanic eruptions occurred within the last 1.6 million years, forming the peaks, mesas, and canyons near Los Alamos. The more recent event 1.2 million years ago, the Valles Eruption, created the 12- to 15-mile wide caldera (collapsed crater) we now see. There are also educational signs at overlooks along Route 4 that describe the cataclysmic event. Let's hope something like that doesn't happen again anytime soon. Over the past 10,000 years humans have used the caldera for hunting, gathering plant foods, and as a source of obsidian, a very hard type of stone used widely for tools and in trading. From 1860 until 2000 the land was privately owned and known as the Baca Ranch. A good bit of the property has mountains covered with thick evergreen and deciduous trees. The remaining photos in this section are from Rabbit Mountain, on the east side of Route 4, where I ran that afternoon. Trees at the lower elevations had new spring leaves but farther up above 9,000 feet the branches were still bare. Elk are about three times as large as deer and have a more serious impact on the environment than their smaller cousins. For example, elk love to eat tender aspen shoots, limiting the regeneration of those trees in the Preserve and nearby Bandelier National Monument. 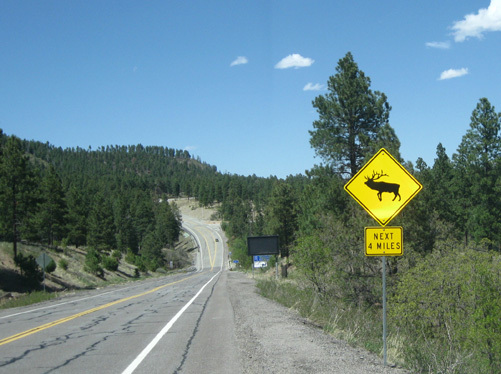 Elk populations have grown out of proportion to other species of plants and animals here; bones found in ancestral Pueblo sites indicate there were fewer elk in the region several hundred years ago than now. The elk population is controlled through hunting in these areas to reduce their negative impact on the environment, including damage to ancient ruins. 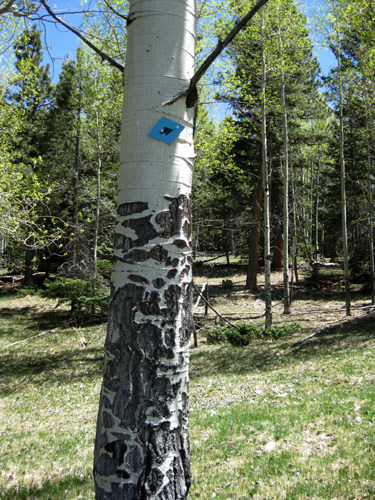 Note the blue marker on the tree above, which shows winter sports enthusiasts which way to go when the trail is covered in snow. 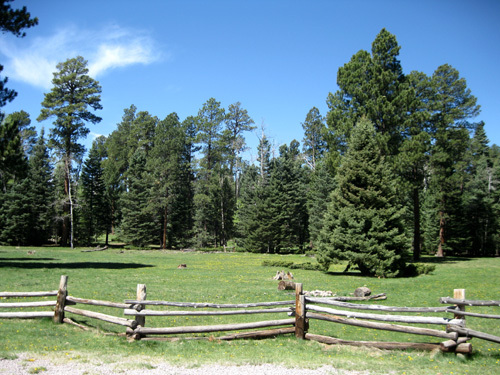 The Preserve is open to the public for day hiking, skiing, snowshoeing, horseback riding, elk hunting, fishing, wagon and sleight rides, and various special events. However, the number of of people allowed in each day is strictly limited through a reservation-only system. The Preserve is the nation's first land management trust. Its primary goal is not high numbers of visitors but "to help restore the land to optimal health while operating a well-functioning and sustainable working ranch, recreation haven, and wildlife preserve," per the official brochures we gathered. This ensures a sense of solitude to all visitors and lessens human impact on the land. The higher I climbed, the fewer deciduous trees that had leaves yet. That allowed more views. There are at least two trails you can use without making reservations or paying an entry fee to the Preserve. 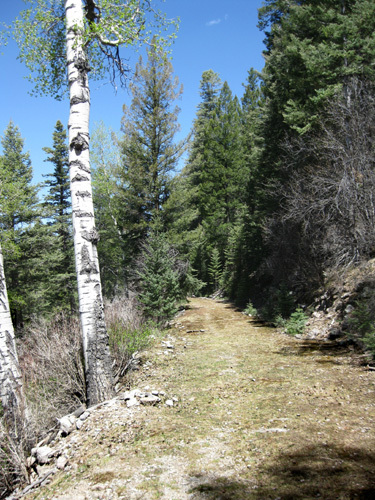 One is the previously-mentioned Valle Grande Trail on the southeastern edge of the park. 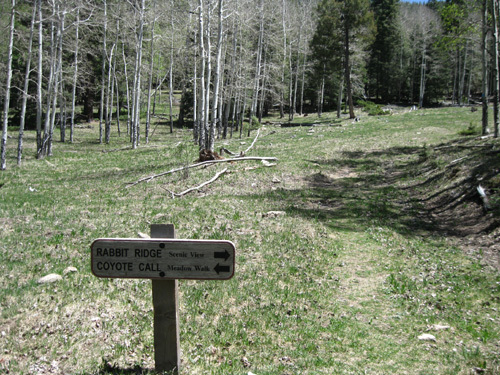 The other is called the Coyote Call Trail, which forms about a four-mile loop on Rabbit Mountain. We stopped at that trailhead on the way back to Los Alamos several hours later. Since he's tapering for his race, Jim took a nap while I hiked up into the woods (about a thousand-foot gain over two miles) and ran back down the wide dirt and grass trails. Dogs aren't allowed in the Preserve so Cody couldn't run with me. That's too bad; he would have enjoyed the patches of snow I found in shady spots above 9,000 feet. That trail is probably much tamer than the gnarly ones Jim will find on the other side of the caldera during the Jemez race on Saturday. 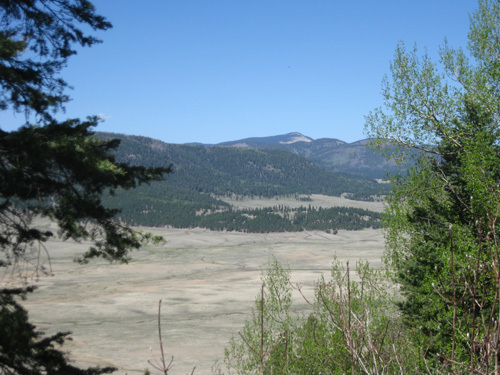 Much of the Scenic Byway on Route 4 south of the Valles Caldera Preserve closely parallels the Jemez River. 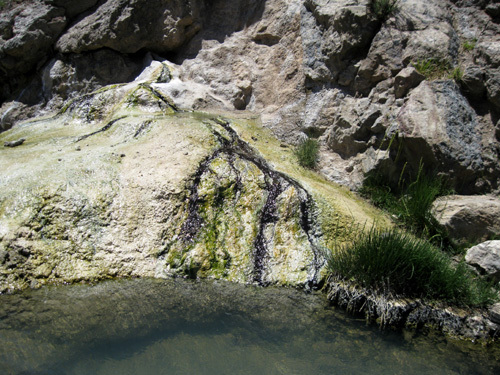 There are several interesting waterfalls and warm or hot springs along the way. 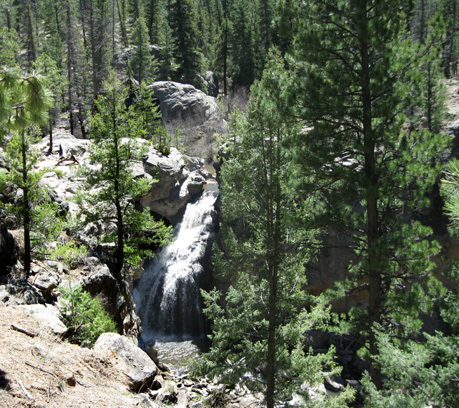 We did a short hike together to see Jemez Falls from the campground off Route 4. If you walk farther down you can reach the rocks at the top of the falls. Another trail continues on another couple miles to McCauley Warm (not hot!) Springs. It is steeper and more difficult. We saved that hike for another visit. A few miles farther south on Route 4 we saw Battleship Rock (next photo). 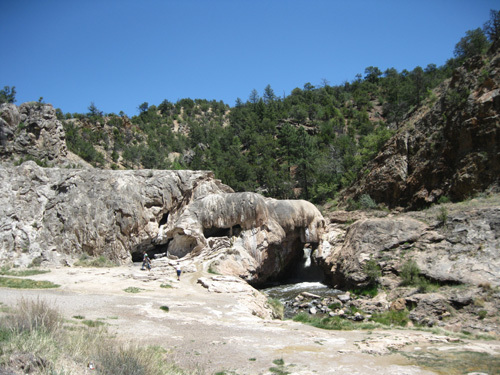 There is a nice picnic area along the Jemez River, below the rock formation. Soda Dam, the next water feature on our route, is very cool. Thanks to one of the other visitors enjoying the rocks and water, we learned about the very warm, brilliantly-colored, unnamed spring across the road that we never would have seen from the truck. 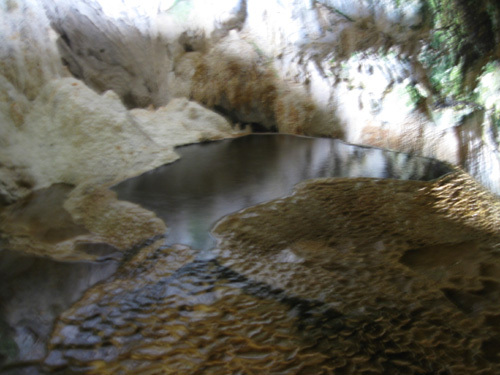 The dam is colorful, with swirling designs, caves you can enter (see below), a little pool inside, stalactites, and stalagmites. Jim took this shot of me to show some perspective re: size of the mineral dam. 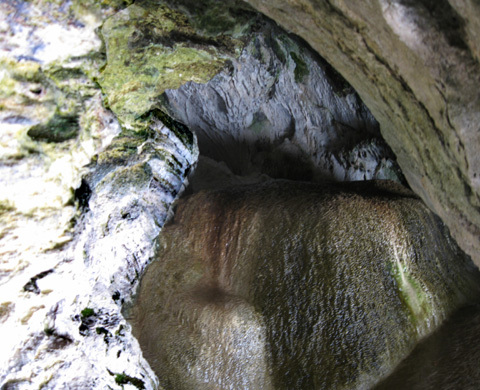 Above: a little pool of water inside one of the caves. 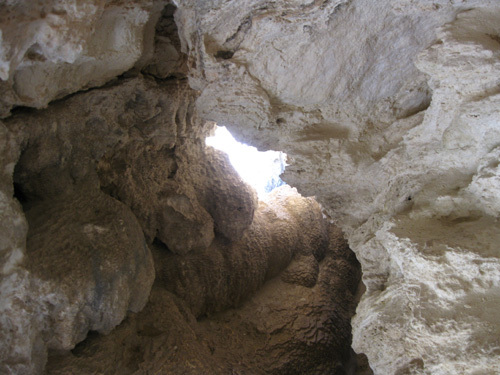 Below: looking up through a hole in the roof of the cave to the sky. The colorful mineral deposits and the wet, crusty surface leading to the dam reminded us of some of the thermal features at Yellowstone. 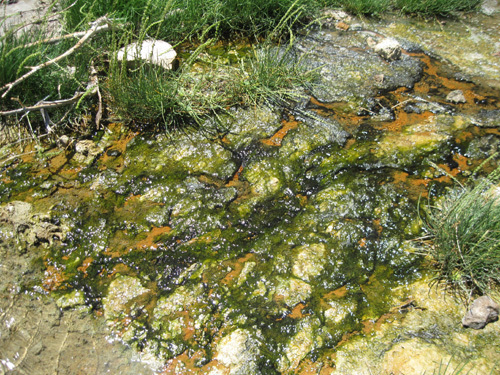 Look at all the bright colors of algae, other plants, and minerals! 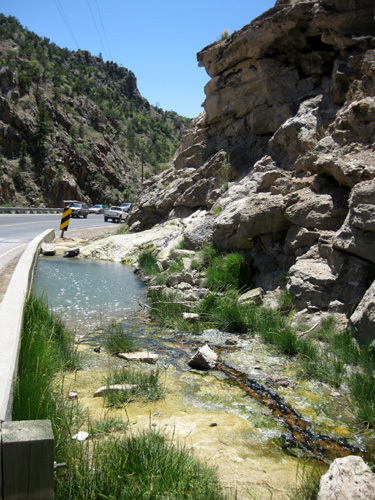 Next on our self-guided tour was the quaint village of Jemez Springs, named for the natural hot springs along the river which flows past town. High, volcanically-layered mesa walls rise on either side of town. 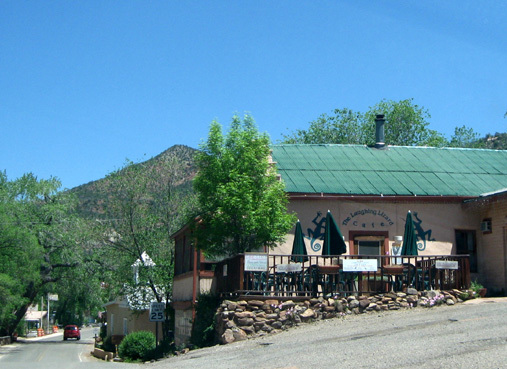 Jemez Springs has a monastery, a Zen retreat, hot baths, restaurants, inns, art galleries, and other interesting little shops. Our ultra running pals Deb and Steve Pero used to live near Jemez Springs a few years ago. They plan to return as soon as they can sell their house in New Hampshire. Both are beautiful places but their hearts are in New Mexico. We hope the photos in this series bring back many good memories of the region for them. SO MANY SITES, SO LITTLE TIME TO SEE THEM ALL! 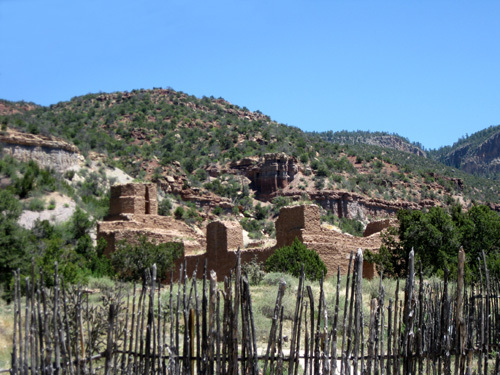 We knew we didn't have time that day to continue farther south along the Jemez Mountain National Scenic Byway to the village of San Ysidro, the southern terminus of the route, so we turned around at Jemez Springs. On the way back to Los Alamos we stopped at Rabbit Mountain, across from the caldera, and I did the run described above. Then we called it a day. 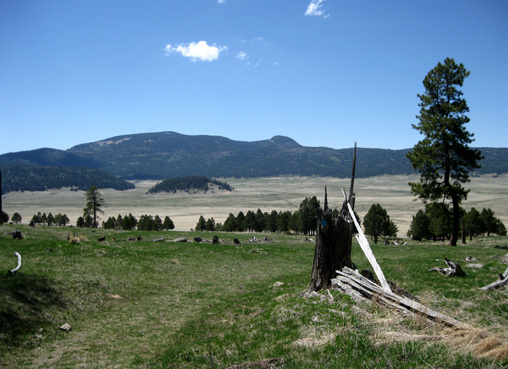 Some of the things we missed this time -- other trails in and near the Valles Caldera Preserve, the Jemez State Monument, shops in Jemez Springs, the Gilman Tunnels, Walatowa Visitor Center, Jemez Pueblo, a winery, and other interesting destinations -- are on my list of Things to Do and See on one or more future trips to the area. There's an important part of this scenic byway that we saved for two other short trips from Los Alamos: the loop on Routes 4, 501, and 502 that goes to Bandelier National Monument, the Tsankawi Ruins, and the town of White Rock. I'll write about the 12th-century pueblos and cliff dwellings at Bandelier in the next entry, then Tsankawi and White Rock in another. I really had to work to get some of the photos of ancient ruins that I'll show you!